If you’re using Annmarie Gianni products, you’re already helping the look of your aging skin. But what if you already have a few wrinkles? What do you do if you want to make them appear less prominent? We have some solutions for you! Though you may not be able to literally turn back the clock, you can make it look like you have. If you want your wrinkles to be less noticeable today, try these tips! A recent survey found that 67 percent of women aged 45 years and older said they had crow’s feet, and about 40 percent said they were bothered by them. In a British survey of 2,000 women, results showed that most women start worrying about aging when they turn 29 years old! Wherever you are in the “worry about aging” spectrum, you’ll probably want to try some of these tricks for fading the look of wrinkles. We’d love to hear about your results! Instant face lift: Egg whites have been known for centuries to help lift the appearance of skin and minimize pores, making wrinkles less noticeable. Separate the yolk from the egg white, then apply as a thin layer over your face. (You can also use a cotton swab to apply around your eyes.) Allow to dry. You will feel the skin tightening. Leave for 10-30 minutes, then rinse off and apply your regularly moisturizer. Apply a little coconut oil. This oil contains a hefty amount of natural fatty acids that help moisturize and hydrate the skin. Apply some directly to the wrinkles and let it soak in. The wrinkles should appear less noticeable. Vitamin E oil and olive oil may also work. Use a primer. Before applying your makeup, use a non-silicone primer. This will help keep makeup from settling into your fine lines and wrinkles. Try a papaya or pineapple mask. Both of these fruits contain enzymes that help exfoliate. They also provide vitamin C antioxidant protection. Simply mash one or both into a bowl (or use a blender), add some honey or yogurt, and apply to skin for 10 minutes. 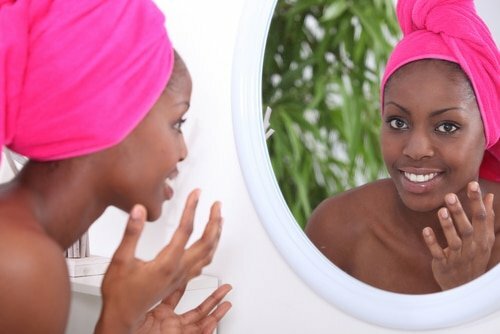 When you wash off, you may notice fewer fine lines and wrinkles. Use turmeric. This powerful spice is full of antioxidants. Mix turmeric powder with sugarcane juice to make a paste, apply on skin, let dry, and then rinse off. You should notice some fading benefits. Continue to use over time to reduce the appearance of wrinkling. Enlist the power of lemon. Antioxidants and natural exfoliating acids in lemon juice help fade the look of fine lines and wrinkles. Mix about one teaspoon lemon juice with one teaspoon yogurt, apply to clean skin, and let dry for 15-30 minutes. When you rinse off, you should notice a lifting, tightening effect. Massage. Increasing circulation to your skin can help it look more healthy and toned, fading the look of fine lines. Try adding some sugar to your egg white mask, then massage the mixture over your face with your fingers in a circular motion. Let it sit for 5-7 minutes, then rinse off and enjoy the tightening effect. Baking soda. This is another natural way to tighten and lift and reduce the appearance of wrinkles. Mix a small amount of baking soda with water and massage onto your skin for about a minute. It will help naturally exfoliate and tighten pores as well as give the skin a lifted look. Rinse off with water. Note: Be sure not to over-exfoliate the skin, as it can lead to irritation, depending on your level of sensitivity. Start with only one-two exfoliating scrubs per week. Don’t forget you can always use our Citrus Stem Cell Serum for lightening, brightening and restoring dull and dry winter skin! Do you have other ways to reduce the look of fine lines and wrinkles? Please let us know! “Survey: Women bothered by crow’s feet, willing to seek novel botulinum toxin treatment,” Dermatology, October 22, 2013, http://www.healio.com/dermatology/aesthetic-cosmetic-surgery/news/online/%7Bc8b3b2b9-1be4-40c2-98e5-34039a6a933d%7D/survey-women-bothered-by-crows-feet-willing-to-seek-novel-botulinum-toxin-treatment. Rina Raphael, “At what age do women start worrying about aging?” Today, October 12, 2012, http://www.today.com/style/what-age-do-women-start-worrying-about-aging-1C6428219.